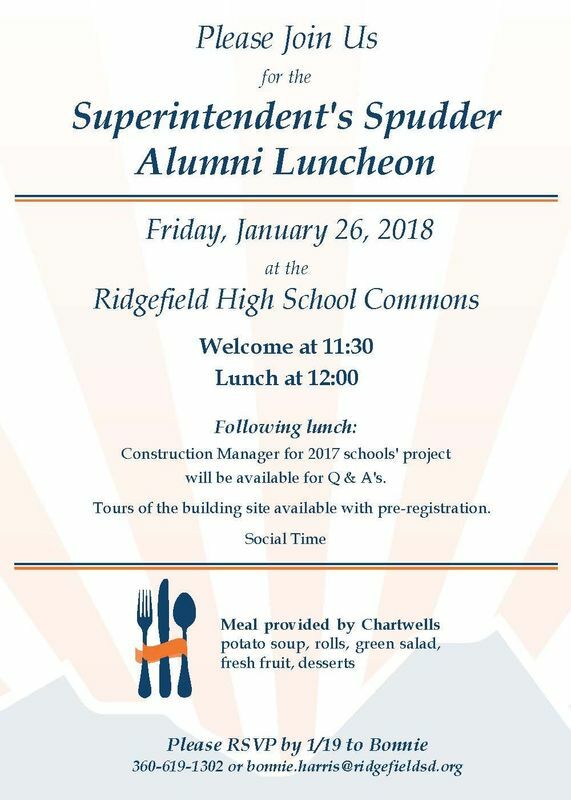 The Ridgefield School District is pleased to extend an invitation to all Ridgefield High School graduates to join us for the annual Superintendent’s Spudder Alumni Luncheon on Friday, January 26. Come and have lunch with fellow Spudders at 12 noon at the RHS Commons. Construction managers will be on hand after lunch to provide updates on the various projects in the district’s 2017 Bond Program and answer any questions you may have. In addition, walking tours of the Grades 5-8 school complex construction site will be offered after the luncheon. Participants will be given hard hats and safety vests to wear and be briefed on safety guidelines before the tour begins. Navigating through the construction site can be a bit challenging, so it is recommended that tour participants be able to walk on their own. Pre-registration for the walking tour is required, and shuttle transportation will be provided to the site. To RSVP for the alumni luncheon and/or to pre-register for the walking tour, please contact Bonnie Harris at 360-619-1302 or by email at bonnie.harris@ridgefieldsd.org by Friday, January 19th.